As Tech works to become a more pedestrian-friendly campus, parking will continue to be a concern. 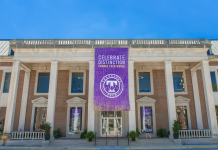 By going directly to the largely unused parking lots on the west side of Willow Avenue, near the intramural fields and the Averitt Express Baseball Complex, and getting on the gold Express Route, you can be at the center of campus in about ten minutes. Instead of going straight to the closest lot and circling out until you find a spot, start where you can find a spot right away (like the lots on the west side of campus and use the campus shuttle). This will ultimately save you time. There are plenty of parking spaces near the center of campus available if you arrive before 7:30 a.m. And you’ll have time to grab a cup of coffee or just chill before class. If it takes you 20 minutes to find a parking spot, plan your arrival on campus with this in mind. In the last two years, Tech has built more than 1,000 permanent parking spaces on the west side of campus across Willow, near the intramural fields. Currently, the majority of these lots are extremely underutilized, often going completely unused. 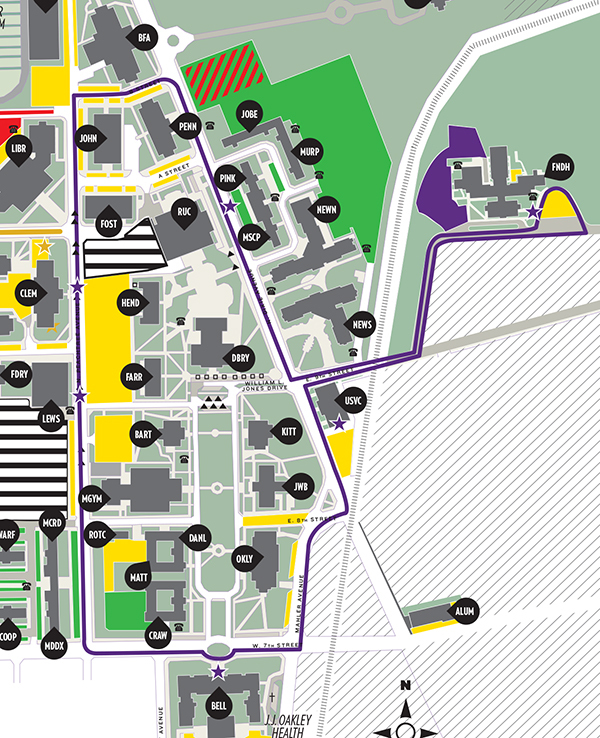 All of the lots west of Willow Avenue are zoned Purple, which can be used by any Tech parking permit. In addition, the temporary lot on Whitney Avenue that opened last year remains open for this year. This lot is zoned Red. Parking in the lot behind Volpe Library continues to be impacted by construction. Tech has tried to minimize this impact by restricting the size of project areas to a minimum. The two short rows at the south end of the lot have been closed as that area is needed to the library excavation project. As the rebricking project moves to the front and sides of the library, some previously blocked spots at the rear of the building will return to use over the course of the semester. The stadium parking lot, zoned Red, is fully open and not impacted by construction. Tech continues to operate two shuttles: a gold Express Route, and a purple Loop Route. Click on each route’s image for a more detailed view. The new gold ‘Express Route’ for the campus shuttle system is a 10-minute loop from the west side parking lots to the center of campus at the corner of University Drive and Peachtree Avenue. It replaces the former Gold Route in order to get a maximum number of passengers from the exterior of campus to the center. 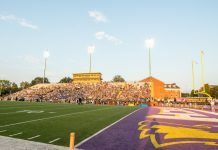 The Express shuttle also stops at the intersection of University Drive and Whitney Avenue, and at the bus stop in the stadium parking lot. 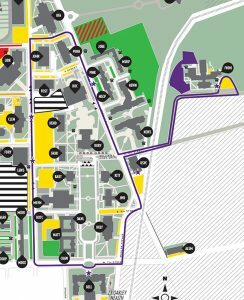 The purple Loop Route is a continuous loop around campus, starting at the bus stop at Clement Hall, with stops at Bell Hall, University Services Building, Foundation Hall and the Roaden University Center. 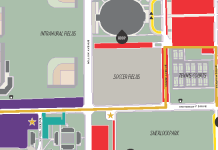 Both routes run Monday through Friday, 6:45 a.m. to 5 p.m.
B Street will continue to be closed to traffic between the stadium and the library parking lot due to construction projects. A pedestrian walkway is available through this area. 8th Street between Peachtree Avenue and Stadium Drive will be closed for the duration of the construction of the Lab Science Building. Access to the inner parking area of Capital Quad residence halls is from 7th Street. Any temporary closures of other campus roads throughout the year will be announced in Tech Times. Private businesses located around campus have the right to control their own parking lots. A Tech parking permit does not give rights to park at independent businesses. Be warned: business owners are having cars parked illegally at their locations towed. Also, city streets are controlled by the City of Cookeville, which also has the right to ticket or tow as applicable. No person shall park a vehicle in front of or within fifteen (15) feet of a public driveway, or garage entrance, unless otherwise designated. No person shall park a vehicle opposite a public or private driveway, or garage entrance, unless there is at least twelve (12) feet of unobstructed roadway or otherwise designated. No person shall park a vehicle within fifteen (15) feet of a mailbox. No person shall park a vehicle within thirty (30) feet of a crosswalk at an intersection, unless otherwise designated. Failure to follow these could result in a parking citation and/or your vehicle being towed at owner’s expense. For questions regarding parking off campus, contact Cookeville Police Department (931) 526-2125.